i love finding new ways to make some of our favorite treats a bit healthier. 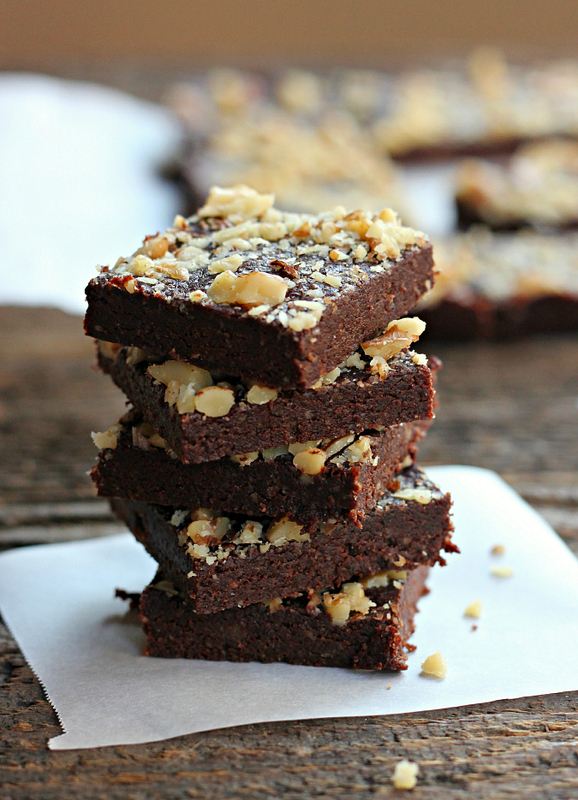 brownies are certainly delicious, but they are far from healthy or low in calories. 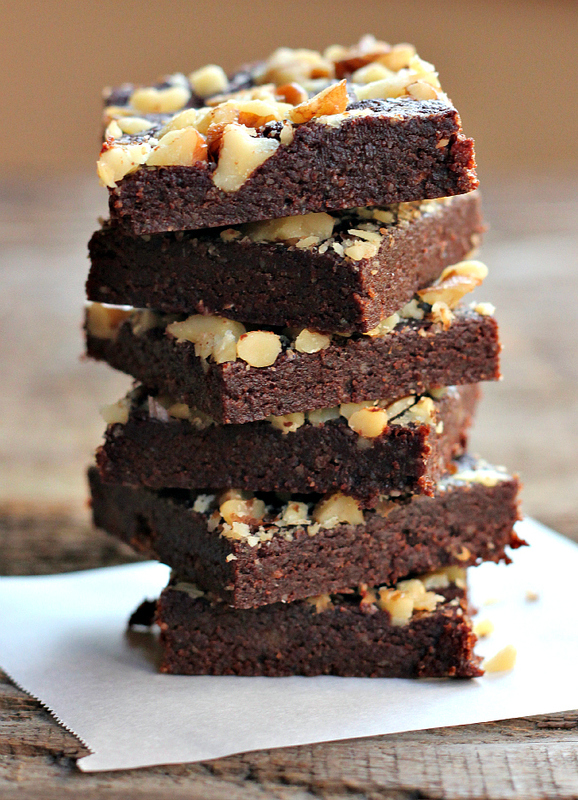 brownies are typically loaded with butter, sugar, eggs, and flour . . . you know, all of the good stuff that makes them delicious. 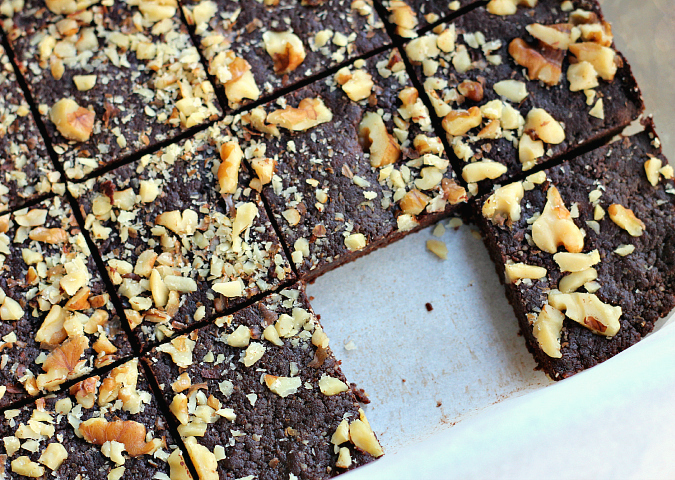 however, these brownies don't contain any butter, sugar, eggs, or flour! they're vegan and gluten free. 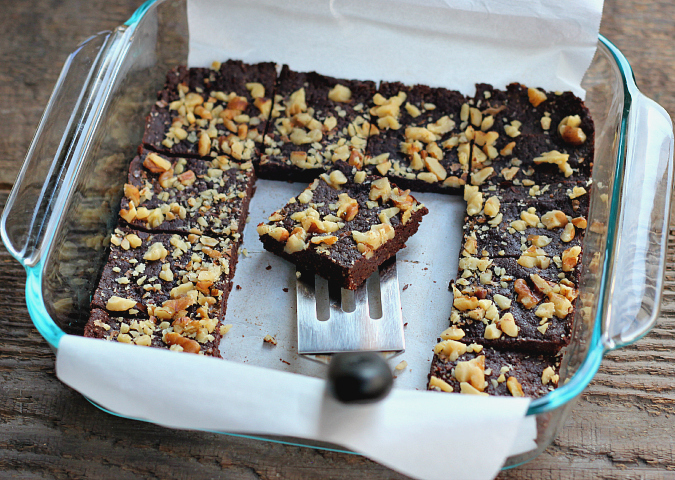 these brownies get their substance from walnuts and dates. 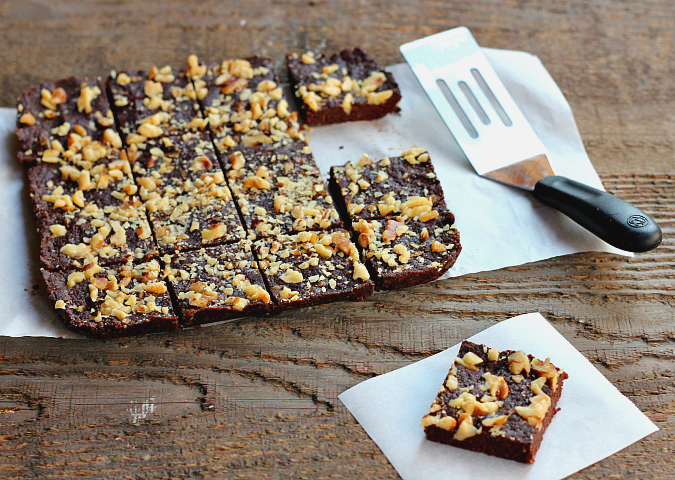 ground walnuts take the place of flour, and the dates naturally sweeten the brownies and bind all of the ingredients together. since these brownies are "no-bake" they don't require any time in the oven, which is especially welcomed on a hot summer day when you are craving chocolate but don't want to heat up the house with the oven. these brownies are awesome. they come together in just a few short minutes with just a few simple ingredients. they are so moist and rich. they are dense and full of deep chocolate flavor with a wonderful hint of espresso. the chunks of walnuts add a great crunch to them too! place 1 cup of the walnuts in a food processor and process until finely ground. add the cocoa power, espresso powder, and sea salt. pulse to combine. transfer the mixture to a separate bowl and set aside. place the dates in the food processor and process until only small bits remain. transfer the pureed dates to a separate bowl and set aside. add the nut mixture back into the food processor. run the food processor while dropping small spoonfuls of the pureed dates down the spout of the food processor. continue until you have added all of the pureed dates. add the mixture to an 8-inch square baking pan lined with parchment paper. press the mixture firmly into the baking pan. chop the remaining 1/4 cup of walnuts. 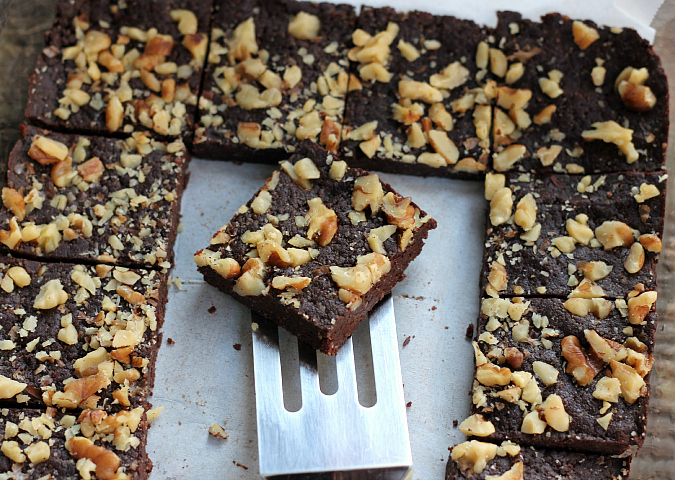 sprinkle the walnuts on top and press them into the brownies. place the brownies in the refrigerator to chill before cutting. They look moist and full of chocolate. 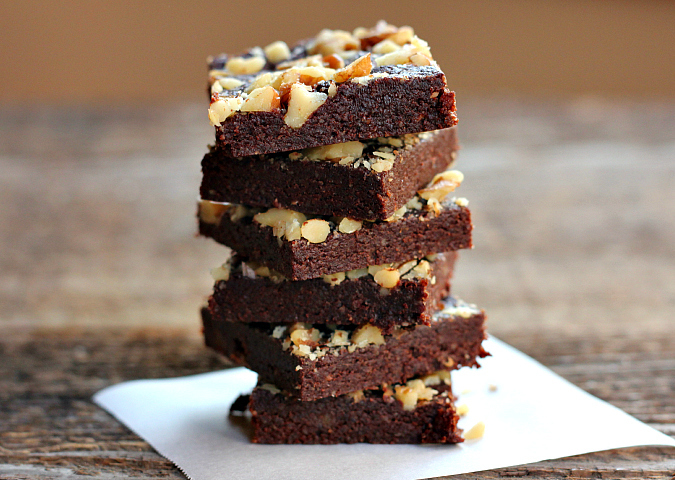 I like brownies with nuts. It gives an extra crunch and flavor. These look so good -featuring at Family Fun Friday this week.